Germany is the most populous European country (apart from Russia), with a population of 82 million. Germany's land area was over 50% larger during the Second Reich (1871-1918) and included most of present-day Poland and parts of Lithuania. German people are the second biggest consumers of beer in the world (after the Czechs), with an average of 107 litres per person per year in 2010 (or 0.30 l per day). The German language was once the lingua franca of central, eastern and northern Europe, and remains the language with the most native speakers in Europe. 15 million people in Germany are of non-German descent (first and second generation), i.e. 18.5% of the population. About half of them are foreign residents, not German citizens. About a quarter of all American citizens claim at least partial German ancestry. Germany has nearly 700 zoological gardens, wildlife parks, aquariums, bird parks, animal reserves, or safari parks, including 414 registered zoos (more than the USA) ! Berlin's Zoologischer Garten is the largest zoo in the world, both in terms of number of species (1,500) and animal population (14,000). In 2006, the world's youngest billionnaire is the German Prince Albert II von Thurn und Taxis, with net worth is estimated at around $1.9 billion (USD). As of 2012, German athletes have won a total of 1662 Olympic medals (summer and winter combined from 1896 to 2012), i.e. more than any other country in the world except the USA. The Fairy Grottoes (Feengrotten) in Saalfeld, Thuringia, are the world's most colourful caves, according to the Guinness Book of Records. There are some 2.5 million half-timbered houses in Allemagne, by far the highest number of any country worldwide. Classical music has been widely dominated by German-speaking composers. 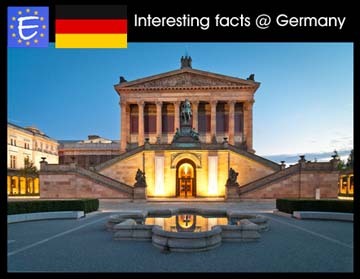 A few famous ones born on the present territory of Germany include Bach, Händel, Beethoven, Schumann, Mendelssohn, Brahms, Wagner and R. Strauss. The Germans can be credited for the discovery of insulin, the invention of the clarinet, the pocket watch, the automated calculator, the light bulb, television (partly), paraffin, petrol/gasoline & Diesel engines, the automobile (as well as the engine, differential gear and other important devices), the motorcycle, the jet engine, the LCD screen and the Walkman. There are 1,300 beer breweries in Germany, making some 5,000 kinds of beer. German people are the world's second biggest beer drinkers after the Czechs. Germany was the first country in the world to adopt Daylight saving time (DST, a.k.a. summer time) in 1916, in the midst of WWI. The Walhalla temple (Hall of Fame and Honor of the German nation) in Regensburg was built by Ludwig I of Bavaria in the early 19th century to commemorate great figures and events in ethnic German history, beginning with the Battle of the Teutoburg Forest (9 CE). The Bayreuth Festspielhaus (Bayreuth Festival Theatre) was specifically conceived and built to host performances of operas by Richard Wagner. It opened in 1876 for the premiere of the four-opera cycle of Der Ring des Nibelungen. As of 1998, there were 5,752 museums in Germany (about as many as Italy and the United Kingdom combined). Germany is one of the last Western European countries not to have banned smoking in workplaces, and restaurants (see map). One of the political reason for this is that the Nazi officially frowned on smoking, and post-war German legislators have been afraid of imitating Nazi regulations. No less than forty-two Nobel Prize laureates studied or taught at the Georg-August University of Göttingen. Nobel Prize winners notwithstanding, famous people who taught there included Carl Friedrich Gauss (1777-1855), the Brothers Grimm. Alumni count among themselves Otto von Bismarck (1815-1898) and the American J. P. Morgan (1837-1913). Germans have been the pioneers of the ecological movement and green politics. The world's first Green Party, Die Grünen, was founded in 1979-1980. Germany is one of the rare countries (along with Belgium) where the Greens have been part of a government coalition (from 1998 to 2005, so far). The term "ecology" was first coined by the German biologist Ernst Haeckel in 1866. Drachenfels (Siebengebirge), in North Rhine-Westphalia, became the world's first nature reserve in 1836. In 2005 Germany produced approximately 35% of the world's wind energy. There are over 20,000 wind turbines off the coast of northern Germany, the largest of which reach 200 metres in height. Germans are among the most avid recyclers. According to a BBC survey, Germany had the third highest recycling rate (48% of waste recycled), only just surpassed by its Swiss and Austrian neighbours. The oldest sun observatory currently known in Europe is the so-called Goseck circle in Saxony-Anhalt. It was built some 7,000 years ago. The Holy Roman Empire of the German Nation was founded by Charlemagne in Aachen in 800 C.E. It lasted over a thousand years, until 1806, when Napoleon dissolved it (mostly because he saw himself as the heir of Charlemagne, the new Emperor of the Occident). The Weihenstephaner Brewery in Freising, Bavaria, has been operating since its foundation in 1040, which makes it the world's oldest brewery. Hildegard of Bingen (1098-1179) is the first composer whose biography is known. Her works are considered the foundation to what later became known as opera (over 400 years later). Germany played a central role in the Reformation of Christianity. Johannes Gutenberg (1400-1468) printed the world's very first Bible in Mainz in 1456. The development the printing press allowed ordinary people to possess a copy of the holy book, previously reserved to the clergy and nobility. It didn't take long before another German, Martin Luther (1483-1546), compared the actual content of the Bible to the teachings and practices of the Catholic Church, and found major discrepancies. In 1517, Luther famously posted his 95 Thesis on the door of the Castle Church in Wittenberg (Saxony-Anhalt), in which he emphasized the Bible as the sole source of religious authority and the church as a priesthood of all believers. The Protestant Reformation would cause the Thirty Years' War (1618-1648) throughout the Holy Roman Empire, and resulted among others in the independence of Switzerland and of the United Provinces of the Netherlands. The University of Marburg (Philipps-Universität Marburg), in Hesse, was founded in 1527 as the world's first Protestant university. The world's oldest savings bank was established in Oldenburg (Lower Saxony) in 1786. The world's first electric tram line was the Gross-Lichterfelde Tramway opened in Berlin suburb of Lichterfelde in 1881. It was built by the Siemens & Halske company, which would later become part of Siemens AG. Germany has had quite a few capitals in its turbulent history, notably (in chronological order) : Aachen (from 794), Regensburg (seat of the Reichstag from 1663 to 1806), Frankfurt-am-Main (site of the election and coronation of German emperors between 1152 and 1792, seat of the Bundestag of the German Confederation from 1815 to 1871), Nuremberg (seat of the Imperial Diet between 1356 and 1543, and official residence of numerous Kings of Germany), Berlin (from 1871 to 1945, and from 1990 to present), and Bonn (from 1949 to 1990 - West Germany only). Ulm Cathedral is the tallest church in the world, with 161.53 metres (530 feet) in height. Cologne Cathedral was the highest building of the world from 1880 to 1889 (or until 1884 if one counts the Washington Monument, which is an obelisk, not a proper building). The Wurzburg Residence possess the world's largest fresco ceiling (677 m² or 7287 square feet). It is the work of Venetian painter Giovanni Battista Tiepolo (1696-1770). The German Autobahn is the oldest motorway network in the world (first section completed in 1932), as well as one of the densest (12,000 km for a country of 357,021 km²). It is also the only one in Europe to have no general speed limit. The world's two biggest cuckoo clocks are both located in Schonach im Schwarzwald, Baden-Württemberg. One of the cuckoos measures nearly five meters and weighs 150 kg. Over 300 bunkers and hundreds of kilometres of underground tunnels built during the Nazi-era still remain under the modern city of Berlin - although mostly unaccessible due to crumbling and floods from water tables. Since 2003, Germany is the world's largest exporter of goods with $1.016 trillion exported in 2005. 10.1% of world exports come from Germany. Germany the world's second producer of cars (after Japan) and motor vehicle in general (after the USA). The German company BASF (Badische Anilin- und Soda-Fabrik) is the second largest chemical company in the world, employing some 87,000 people in 160 subsidiaries and joint ventures in 41 countries. Germany was ranked by the World Competitiveness Yearbook as No. 1 in patent and copyright protection. After suffering from one of the highest unemployment rates in Europe (12% in 2006), Germany now has one of the lowest (5.4% in 2012). As of 2006, Germany had the highest corporate tax rate in Europe, close to 40%. The biggest train station in Europe opened in Berlin in 2006. The European Central Bank is located in Frankfurt-am-Main, Germany. Frankfurt International Airport claims the world record in the most international destinations served. The Lufthansa, based in Frankfurt, is the world's largest airline in terms of international passengers carried, and Europe's largest in terms of passenger-kilometers flown, freight tonne-kilometers flown and fleet size. DELAG, (Deutsche Luftschiffahrts-Aktiengesellschaft, translating as "German Airship Transport Corporation") was the world's first airline. It was founded on 16 November 1909 in Frankfurt. Despite the common cliché that German people are hard workers, statistics on the average annual hours actually worked per worker show that Germans actually work the least hours of any OECD country, and this hasn't changed since the statistics started in 2000. In 2014 each worked totalled 1371 hours per year, which is a bit over 26 hours per week in average. In comparison Italians worked 30% more and Greeks 50% longer. The largest department store in continental Europe is the KaDeWe (Kaufhaus des Westens) in Berlin, with over 60,000 square metres. According to Wealthinsight's World City Millionaire Rankings May 2013, the Frankfurt urban area has more millionaires per capita than in other city surveyed worldwide. Munich comes second.